The Little House of Concrete Bookshelves: Dominic Knight "Comrades"
While the ostensible reason for The Actor's visit last Friday was to discuss the finer details of the proposed remodelling of the LHoC kitchen it wasn't long before attention was refocussed onto the usual wide-ranging discussion, covering (iirc) among other topics Martin Cruz Smith, The King's Speech, Afghanistan and that perennial favourite, the disturbing lack of actual substance and principles in what currently passes for political discourse in Australia. 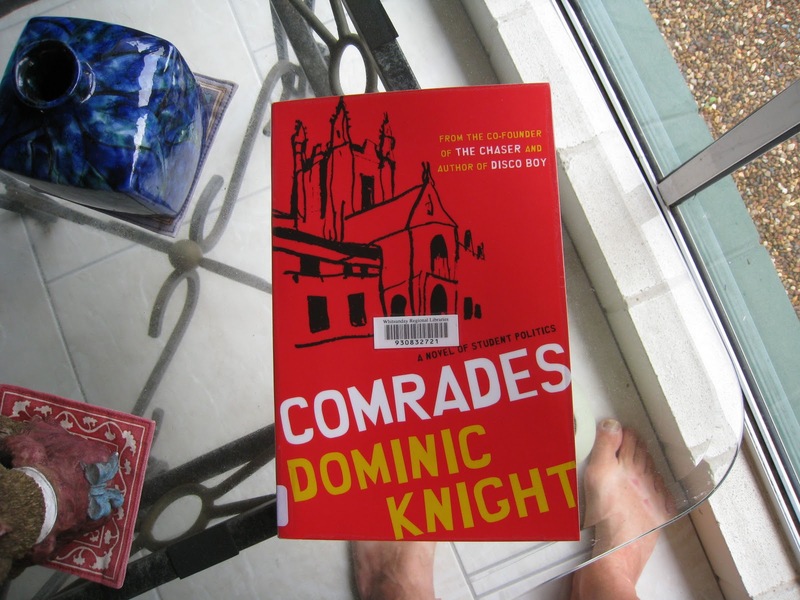 I disappeared briefly into the office, brandishing the local library's copy of Comrades by The Chaser's Dominic Knight. Sydney University, boasting among its alumni Gough Whitlam, Bob Ellis, John Howard, Tony Abbot and Joe Hockey may or may not be the nation's leading training ground for student politicians with aspirations to national prominence, but it's certainly been a significant factor in the development of a number of the nation's leading political figures. There's a more complete list here. 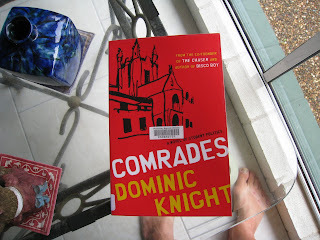 A reading of Comrades, however, suggests for most aspiring student politicians the manipulation of electoral results, the ins and outs of factional intrigue and putting one over the other mob are far more important than ideology, policy or principle. Given the number of ex-student political identities at the top levels of State and Federal politics and the aforementioned state of political discourse it seems like old habits die hard. As Comrades opens, Sydney University SRC President Eddie Flanagan has a problem. While his term of office has a while to run, forthcoming elections for next year's Council means he needs to decide who he's going to support. As the incumbent, as a major player in the Labour Left faction and as a resident of The Mothership, the share house that's the faction's headquarters he's obviously going to be approached by potential candidates for the Presidency. Sunita Shahane is one of them, and she enlists the support of Eddie's now-Canberra-based girlfriend and presidential predecessor to overturn the faction's chosen candidate (Eddie's favoured nominee) when her first tilt at the nomination is unsuccessful. Having done that, predictably, she wants to maximize her chances by enlisting the incumbent President as her campaign manager, which brings Eddie into the negotiations about second preferences and How To Vote cards. The actual election has, as usual, attracted the usual array of candidates ranging from the serious (Sunita, campaigning as Sunny, the Left Alliance's Pema Adams and Bianca Robinson, girlfriend of closet-Young-Liberal Union President and Rhodes Scholarship prospect Giles Kendall) to the absurd (an aspiring comedian dressed as a rooster) and various points in between. As events unfold the major concern involves second preferences and the second guessing required to figure out who was going to run third, and would subsequently have their preferences directed towards the two front runners. There's also a fair bit of manipulation of electoral procedure, including a regular scam that looks like catapulting Bianca into the lead and a countermove masterminded by Electoral Officer Ron, who's had a gutful of the obvious rotting of postal votes. There are a number of intertwining subplots as loyalties and principles go out the window, party and factional lines are crossed, and back room deals are made. The campaign winds up with a predictable outcome along with some predictable and not quite anticipated consequences. Student politics might not be the most promising subject matter as far as a wider readership is concerned, but Knight manipulates his characters and plot lines well, resulting in an enjoyable read as Eddie Flanagan attempts to reconcile his hopes and ideals with political reality. Given the time frame, the period just before the Howard government's push for voluntary student unionism, the likelihood of the key characters moving into State and Federal politics and their possible involvement in subsequent political events Knight has the potential for a rather interesting series of political satires. It'll be interesting to see whether he chooses to use it.